Live amongst the tree tops in this beautifully updated 2/2 CORNER condo. BRAND NEW kitchen topped with gleaming QUARTZ counters and new stainless-steel appliances. All new IMPACT windows & doors at a cost of over $17k! Freshly painted with beautiful tile throughout the living area, updated bathrooms and a superior VIEW of the gumbo limbo trees and canal which surrounds this island community. TONS of amenities including 24-hour gated security, 3 heated pools, clubhouse, billiard room, bbq grills, bike storage, car wash area and exercise rooms with saunas. 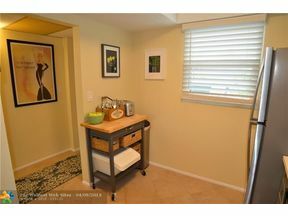 Get all this with LOW HOA fees and still close to downtown Oakland Park & Wilton Manors. Adjacent to the community is Oakland Bark, Easterline Park, Royal Palm Park and the Stunson Nature Trail!